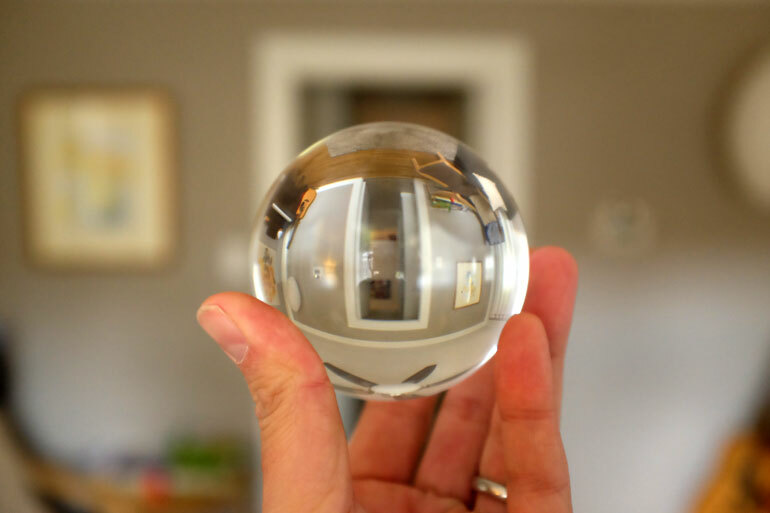 Lensball Review - Is This Crystal Ball in Your Future? The Lensball Pro is a high quality crystal ball that you can use for photography – or timelapse video – that gives you a unique photo tool to add to your arsenal. 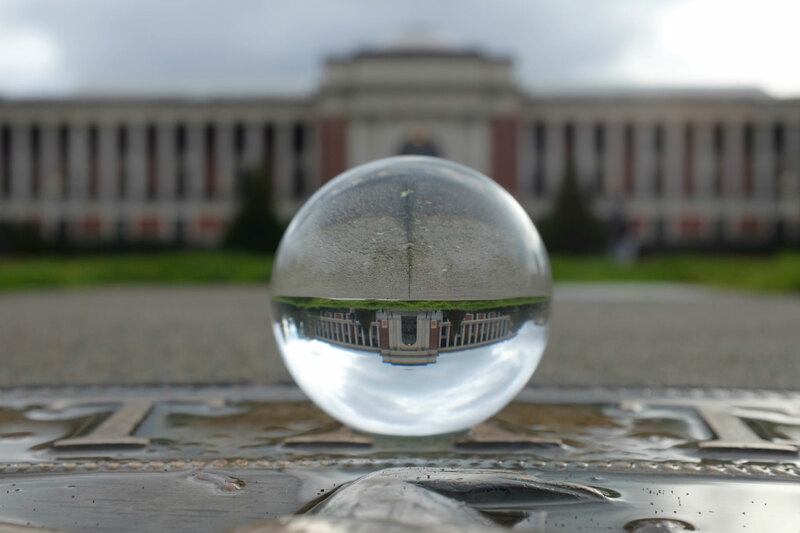 Essentially, you either hold the lensball or you place it on a surface where it won’t roll away, and then you snap a photo that gives you a unique image, like looking at your scene through a crystal ball. It’s not more complicated than that. The lens ball is a neat visual treat that adds a little oomph to your photos (or timelapse videos). Is it essential to your kit? No, of course not. But it’s rad. And affordable enough that you don’t really need to overthink the purchase. Do you want a lens ball? Do you want to gift a photographer in your life something neat? Then get a Lensball Pro. Don’t bother with cheap alternatives, because none of them are made with the manufacturing precision of an authentic Lensball. Travel and landscape photographers can use the Lensball to provide a different perspective to scenes that have been photographed a million times over. But for most nonprofessional photographers, the Lensball gives you one more unique image that you can use for social media, product promos, or simply fun pics of family and friends. 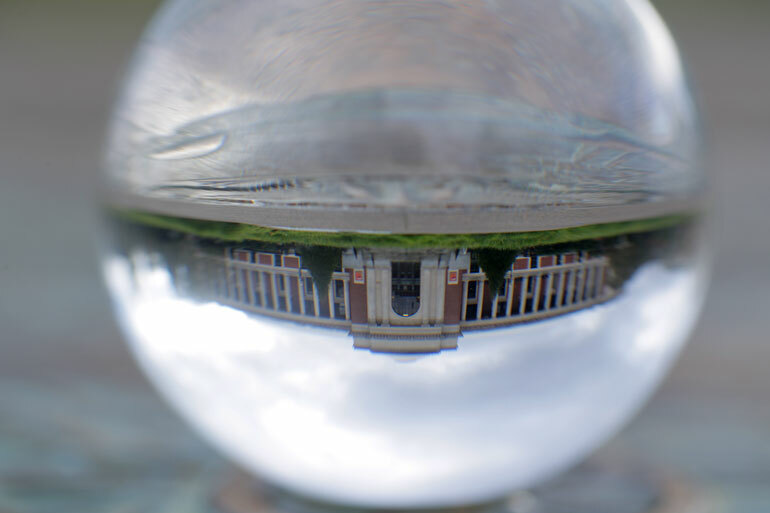 For example, we took the Lensball out to the nearby university and spent about 15 minutes getting a variety of shots of a building, using different lenses, until we came to one that satisfied our creative impulse. After posting it on social media, it drew attention and became a unique, scroll-stopping image that made people happy and drew a lot of likes. After this first use, we generated a lot more ideas about how to use it for future fun photos. And that’s kind of the whole point of adding something like the Lensball to your arsenal: you unlock new creative ideas for photographs that didn’t exist before. Sometimes that’s the magic of getting new gear or video and photo accessories that are way outside your normal kit. 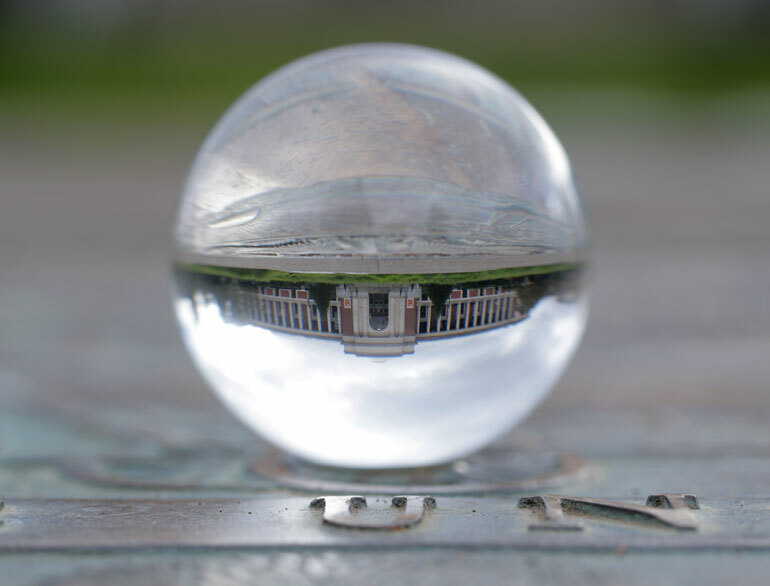 For more inspiration for Lensball use cases, just do a Google Image Search for Lensball. Or join the official Lensball Facebook group. It’s amazing what people are doing with Lensballs. For the above shoot, we used the Canon 1DX mkII, and we took a variety of photos with a Canon 100mm f/2.8L Macro lens, a Canon 70-200mm f/4 IS zoom lens, a Canon 16-35 f/4 IS wide angle lens, and a Fuji X100s with a fixed 23mm f/2 lens. All of the lenses had different visual properties, and shooting at a wide aperture versus stopped down also created different looks. The zoom and macro lenses allowed us to focus entirely on the Lensball, without seeing the background image at all. 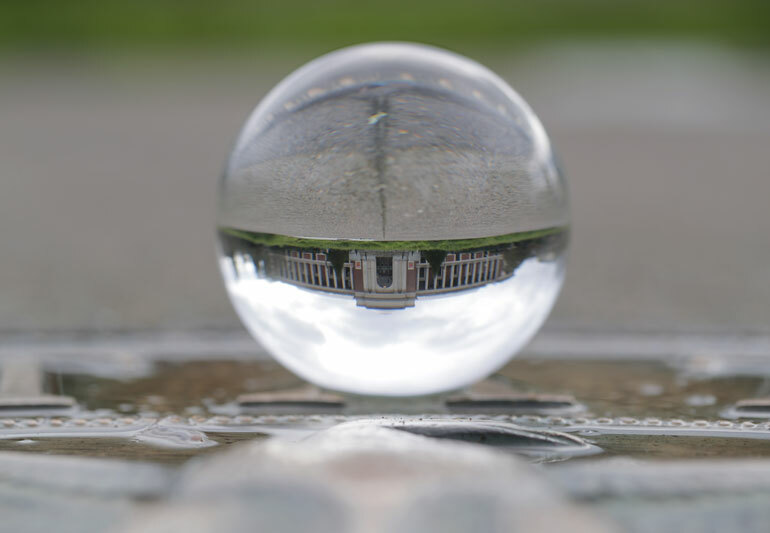 Whereas the wide angle lens and the Fuji X100s gave us a neat image that combined a Lensball and a slightly blurred background that added context to the scene. In all these shots, we had to essentially lay on the ground to position the camera in a way that we could frame the photo. We also placed the Lensball in a part of the bronze ground statue that kept it from rolling away. More on that in a bit. 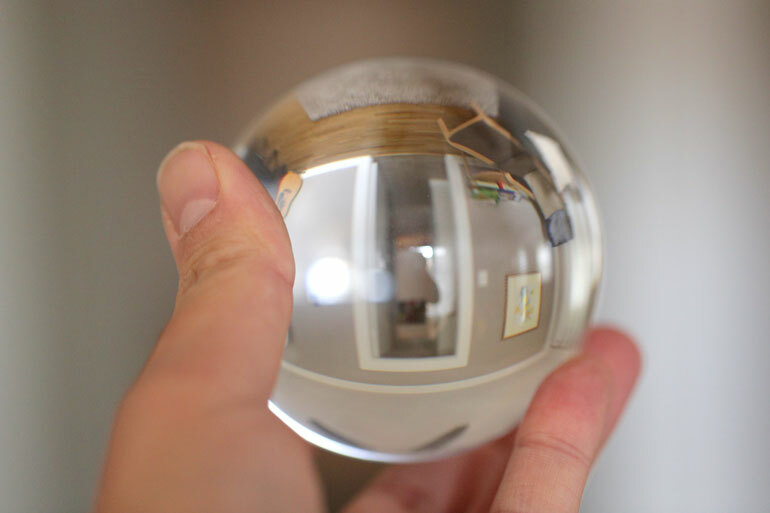 There are a lot of crystal balls out there that you can use for crystal ball photography. But where Lensball excels is in its quality production. 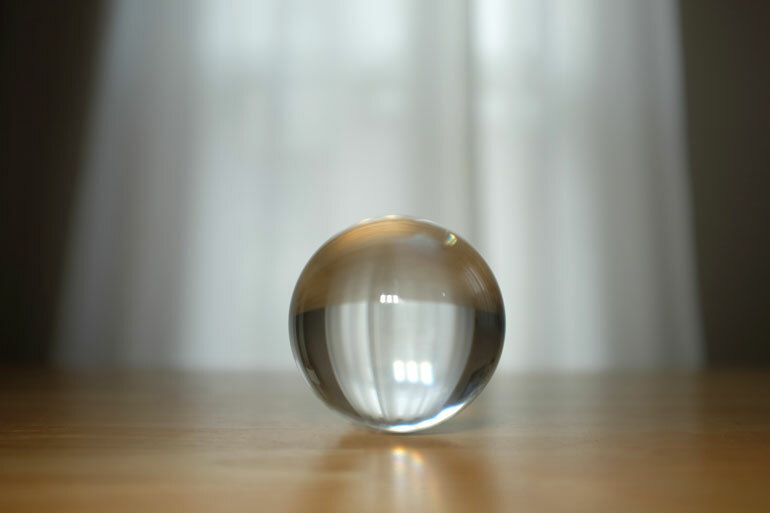 And when it comes to a crystal ball photo, you want a perfect glass ball. Lensball is a company in the Netherlands that concentrates on one thing: manufacturing the perfect glass ball for photographers. 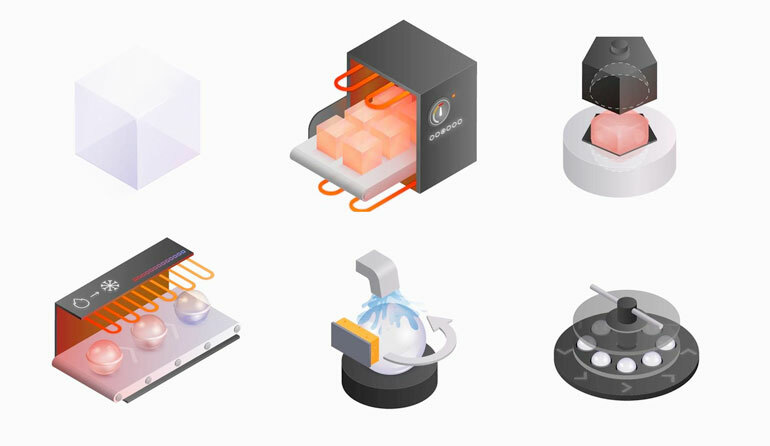 Each lensball goes through multiple levels of quality control, from sourcing high quality crystal bars that are cut into perfect cubes (using diamond cutting blades), to heating and moulding using a hydraulic mould press, to cooling down gradually to room temperature in order to avoid imperfections or bubbles. 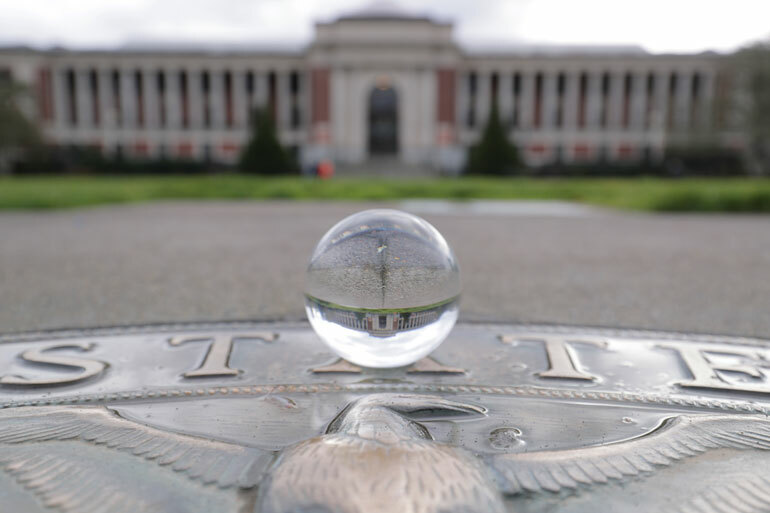 When a lensball is cooled down, it goes through multiple polishing steps to create a perfectly round surface. The process is finished with a high speed polishing tool that runs for 40 minutes, and each lens ball is inspected for imperfections. Only one out of four glass balls pass the perfection test, ready to ship to photographers. The others go back to the beginning of the process. Because it’s a perfectly round glass ball, the most challenging part of using a Lensball is figuring out how to make it stay put. You can use your hand to hold it, of course, and many crystal ball photos out there make use of the hand as part of the image. Just maybe make sure your fingernails are clipped beforehand. 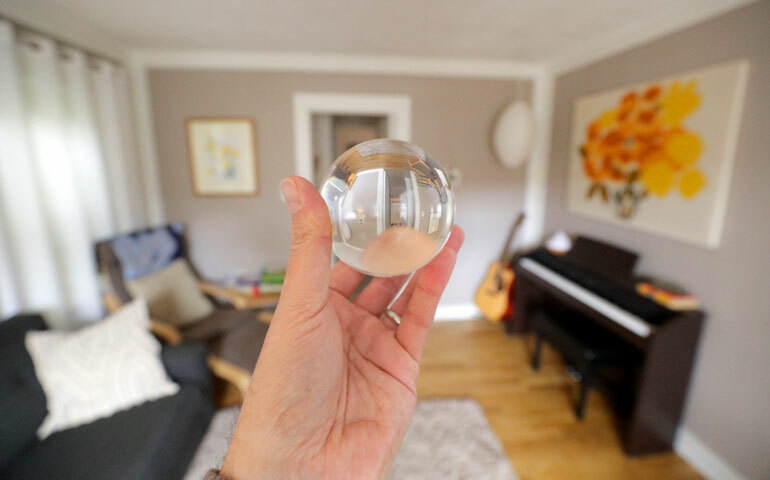 The one challenging part of handholding a Lensball is relying on your camera’s autofocus while you’re holding it with your other hand. Macro autofocus is always a little iffy. Alternatively, you could set your camera to manual focus and bracket a few shots to make sure you have one that’s golden. If you want to set it down, you either need to ensure that it doesn’t roll away, or you should place it on a surface that isn’t completely flat. 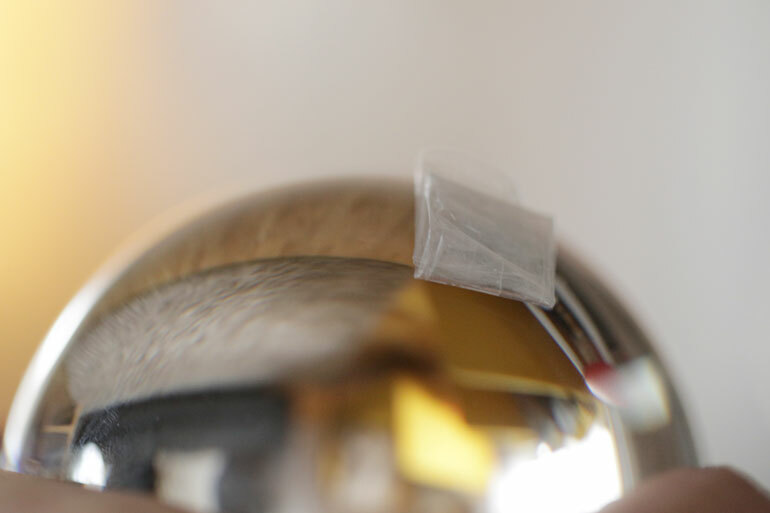 For starters, you can simply apply some tape or a piece of gum to the ball. Later you can remove that object by editing it out in Photoshop or your favorite editing program. In the first photo in this article, we used a piece of scotch tape, and then applied the Pattern Stamp tool to get rid of it in the image. The other thing to note is that the image inside the Lensball will be flipped. If you’re shooting with a macro or zoom lens, you can flip the photo back to right side up. 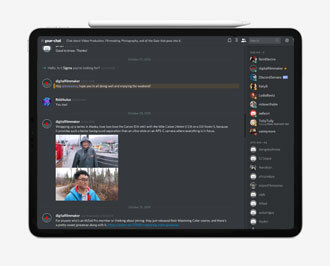 Or you can embrace the flipped image with a wide angle perspective. Or better yet, find a scene that has a perfect reflection and use it to your advantage. 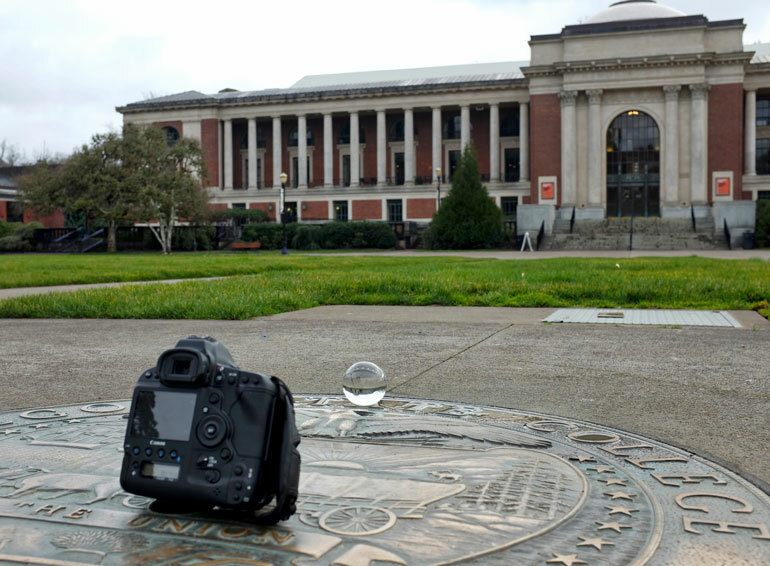 Lensball does have a solution for keeping the ball in place, which is especially useful if you’re shooting timelapse or long exposure photography and you need it to remain static for long periods of time. 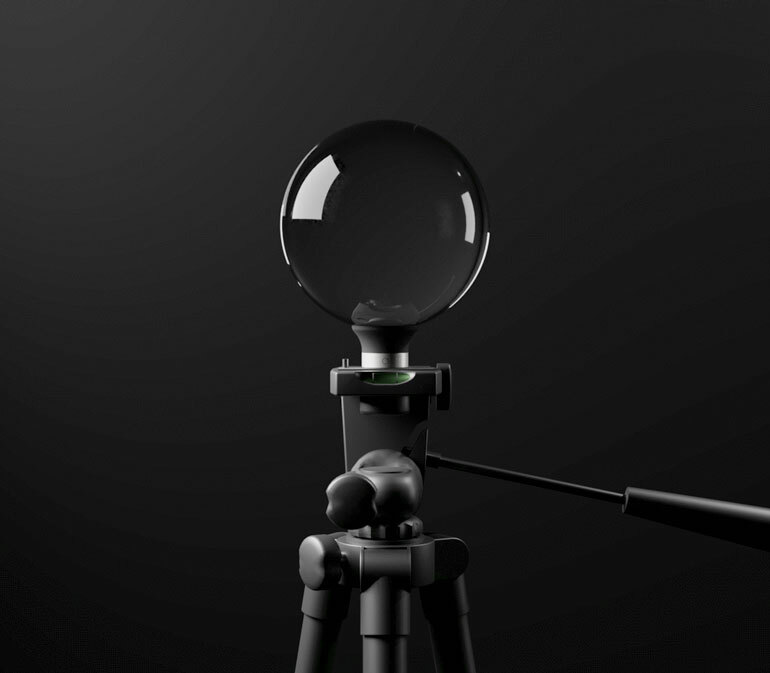 The Lensball Stand has a tripod mount built-in, so you free yourself from having to shoot the ball on the ground, or handholding it. We didn’t have one for this review, but we think the stand is an essential accessory. Especially if you want to zoom in and shoot just the ball reflection, without the stand in the frame. Lensball comes in two sizes: the 60m Pocket and the 80mm Pro. Both models go through the same high standard of quality control – it just depends on what you want to spend and how large of a ball you think you’ll want. The Lensball Pocket is certainly nice in that you can carry it around in your kit without it taking up a lot of space. 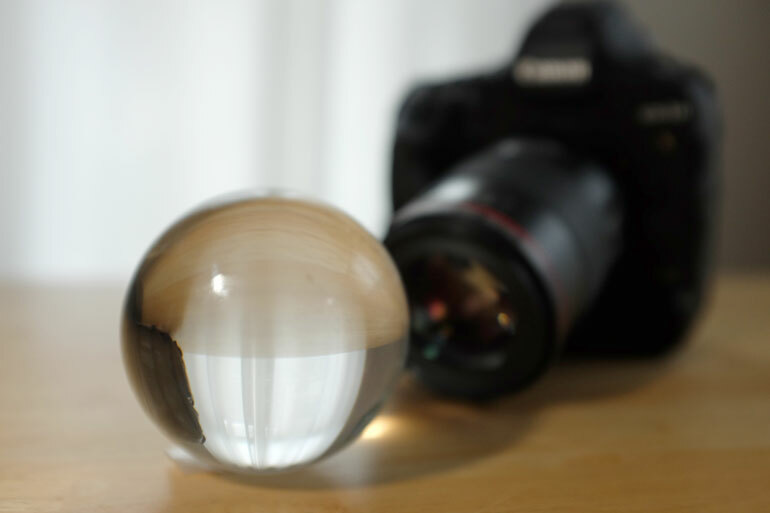 But for our buck, the Lensball Pro is the perfect size for crystal ball photography. 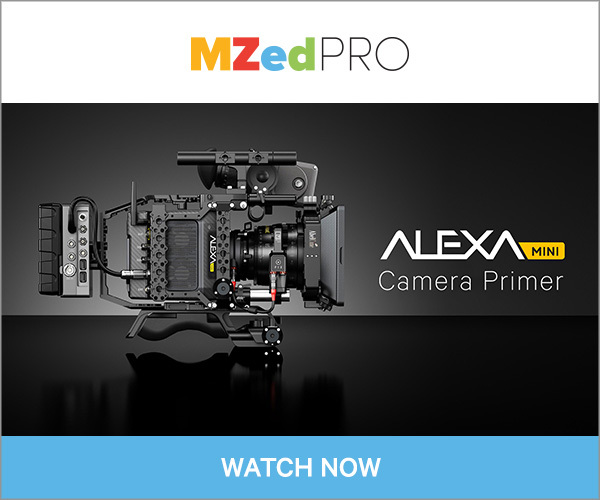 It enables you to use a wider variety of lenses to frame your scene – with or without your hand in it. The main consideration is keeping the Lensball safe during travel. You don’t want to just throw it in your gear – it’s glass, after all. 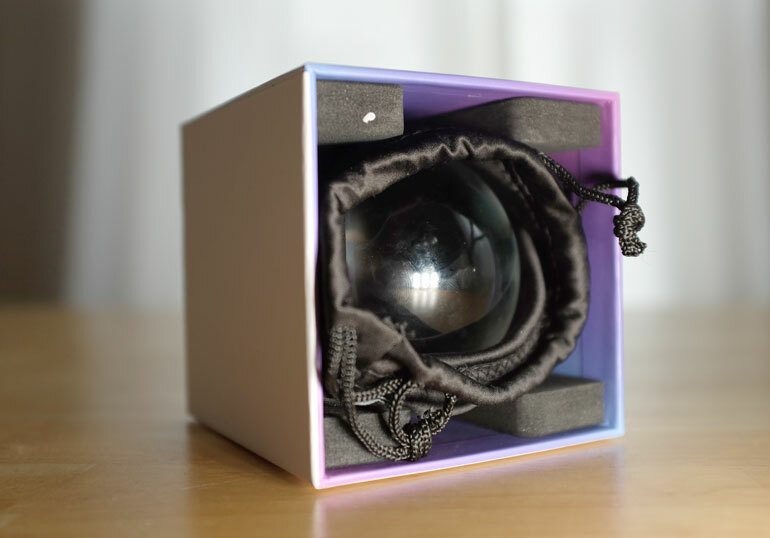 Lensball provides a nice microfiber sleeve and you can also keep it in the included box. Just remember that this is a highly reflective glass ball, which has the ability to focus heat directly onto a surface and make it hot. You don’t need to get out your Boy Scouts manual, however. Just remember to keep your Lensball inside the case rather than leave it near a window for extended periods of time. The last thing of note is that the Lensball Pocket and Lensball Pro aren’t featherlight. The Pro is 1.5 lbs and the Pocket is 0.5 lbs. And to get a sweet photo of a Lensball in the air, you may have to toss it up in the air, snap a photo, and try really hard to catch it before it stubs your toe.